Nothing makes a neem tree happier than 90-degree+ temperatures and rain nearly every afternoon, so the greenhouse is gorgeous this summer, even if the people who work in it are wilting! Seeds are running a little late this year because we’re getting them in Florida rather than Mexico but our fingers are crossed that they’ll be ready very soon. * We have several teams across the state working on this, but give me a call at 813-689-216 if you have seeds you would like us to buy. If you’re thinking about buying a tulsi plant, now is a great time. We decided to plant both the traditional purple-tinged Krishna variety and the nearly neon green Kapoor earlier this spring. I think we had about a 1000% germination rate on the Kapoor so we’re giving them away while supplies last. Click here to learn more: https://neemtreefarms.com/shop/holy-basil-aka-tulsi/ and let us know what you think about the different species. 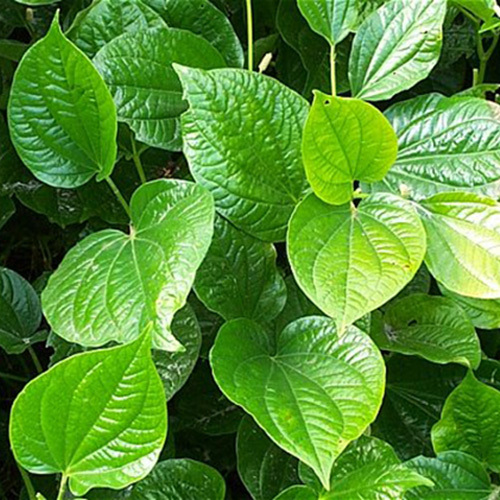 Another plant that loves high temperatures and humidity is the betel leaf that’s practically overflowing its space in the greenhouse. Although less medicinal than most of the Ayurvedic herbs we sell, it’s probably the prettiest plant and the easiest to grow. It thrives in low light and actually prefers to sit in water so you can fill up a saucer and let it grow for days without any additional attention. And, after more than a year, our bael (aka bilva) finally looks good enough to sell. The trick was keeping it shady – which we learned by mistake because we moved it out of the high-sun section of the greenhouse because we needed that space. Ashwagandha and brahmi (bacopa) are both in stock and looking great! From my personal garden, we’re back in stock on free Everglade tomato and milkweed seeds, plus I’m harvesting tons of Seminole pumpkin for Florida gardeners in October or other locations next spring. This amazing plant practically took over my side yard and we gave away more fruit than I can count. It’s super tasty baked and served with either cinnamon and butter for a healthy sweet treat, or with parmesan cheese and Old Bay crab seasoning if you prefer savory. For a very limited time, we’re also giving away plants and seeds from a white orchid tree, preferably to people who will grow them in pots in colder locations. I’ve had them in my yard for most of my life and never noticed a particular problem. Recently the state of Florida tagged them as invasive in South and Central Florida so I’m a little leery of planting them. We have about a dozen plants but a good number of seeds I never got around to putting in soil. Like neem, they’re happy in pots that spend the summer outside and the winter indoors, but they’re far more decorative with large white blooms all winter long. Finally, there were two interesting articles published on neem recently that should be of particular interest to gardeners. First, a report from Phytochemistry showing that neem oil and plant-growth promoting bacteria (PGPB) both elicit systemic responses in tomato plants that help ward off insects without the use of more toxic pesticides. And from the Southeast Asian Journal of Tropical Medical Public Health: Thai neem oil kills up to 100% of fourth-stage Andes aegypti larva at 48 hours, although mortality rates dropped to below 25% after 12 days. Don’t forget our July specials plus free full-sized samples of some of our favorite products. They’re officially “expired” but we checked them out on our chief guinea pig (Vicki) who said they worked just fine for her. Be sure to use them this summer, and don’t stash them under a bathroom sink for another couple of years though! Let us know how your garden is growing this summer! Post photos on our Facebook page or email them to vicki@neemtreefarms.com. Statements made on sites linked to this article have not been approved by the FDA. Neem Tree Farms does not sell products which are intended to diagnose, cure, treat, prevent or cure any disease or kill or repel pests except those registered through the EPA for plants.